Finnish start-up Eve is looking to take on the big dogs of the tablet world with its first device, the T1. The affordably priced Windows 8.1 toting slate offers plenty of specs for an impressive €159 price-tag, but just how good is it? 2015 is already shaping up well for those making and looking to buy bargain priced tablets. Nokia has taken its sleek iPad Mini-esque N1 to China, Jolla's Tablet racked up the funding on Indiegogo and now Eve is getting into the game with the T1. The 8-inch Windows 8.1 tab has plenty to offer other than a great price though. It's built with premium materials, packs 2GB RAM and 32GB internal storage and has a high-res IPS display. But what's it like to use? Let's find out. The Eve T1 tablet is really a tale of two halves when it comes to build quality. The materials used are impressive and, for the price anyway, feel rather premium. On the back there's a nice textured plastic that has a swirling circular pattern, it's grippy and repels fingerprints and oily residue well. It's far from the cheap feeling, thin plastic casings we've come to expect from budget Windows and Android slates. It might sound like a small detail, but the volume rocker and power buttons are both aluminium. It's a really nice touch as the buttons aren't at all mushy but feel solid when pressed. While the rear doesn't catch fingerprints, the front most certainly does. The glossy finish is a magnet for smudges and we found ourselves constantly wiping it down after even the smallest amount of use. That said, Eve has done a really job minimising the bezels on this tablet and keeping it free from overbearing branding. Aside from the Windows logo on the bottom, which also doubles as a capacitive home button, there's nothing else taking up space on the front. The Eve T1 gets another thumbs up from us for its overall size, it's perfect for a tablet. 7-inches isn't enough, while heading into the 10+-inch territory loses the portability factor somewhat. 8-inches is bang on, especially for consuming media and playing games. The overall look is great, especially for something that costs under £150, but we do have some serious concerns about build quality. This thing creaks, and creaks a lot. Whenever we pressed down even remotely hard on the display it made an unsettling squelching sound, like we were touching the components inside. Same goes when tapping the back, it's strange. It also bends. Really easily. Apply pressure to either end and the tablet moves with you, again making noises you really don't want to hear. We might be sounding a little harsh here, considering this is bargain slate that doesn't skimp on the materials, but it's still a valid point whatever the price point is. Tablets on the lower end of the price scale tend to skimp in one of two areas. Display quality or materials. We've already established that the textured matte plastic is far from cheap feeling, so that must mean the screen is a dud. Actually, no. The 8-inch IPS panel packs a 1,280 x 800 resolution, boasts really good viewing angles and even impressed us when we were using it in bright sunshine. It's not the most detailed of displays, pixels are visible most of the time and colours can sometimes look a tad washed out, but overall it does the job. We watched a few videos on Netflix and didn't have any issues and reading text on a web page is also perfectly acceptable. We would have liked a little more brightness though, as even the highest settings was sometimes to dim for our eyes. After being impressed with the materials used and the display, we thought the thing was going to let this tablet down was its performance. Again, we were pleasantly surprised. It might be cheap, but the Eve T1 has some impressive specs. You've got an Intel Bay Trail Z3735F processor clocked at 1.8 GHz, paired with 2GB RAM and 32GB internal storage. The detail there that really stood out was the 2GB RAM, a real must for a tablet running Windows 8.1 so we're glad Eve didn't skimp on it. Scrolling, opening apps and moving through the operating system was a lag free, smooth experience just about all of the time. Apps opened up instantly, the device booted up in a matter of seconds and it handled multitasking, even with multiple windows open, without breaking sweat. Colour us impressed. You still have to deal with the sometimes slow animations that we've come to expect from Windows, but that isn't the fault of the tablet. As this is full Windows 8.1, not a toned down version like Windows RT, you get the same experience as you would running a desktop PC or laptop. Now, we're not going to get into a discussion about the pros and cons of Windows 8.1 here, we've done that plenty of times before and the upcoming Windows 10 update sorts the majority of those problems out, but there are a few things worth mentioning. The tiled 'Start' screen might be a pain on a desk bound computer, but it's pretty great on a tablet. As soon as you unlock the device your homescreen shows all sort of useful information without forcing you into countless different apps. You can get a weather rundown, see if you've got any emails, glance at the breaking news stories or stay updated as to when your next calendar event is. Even though you can jump out of the 'Start' screen and into Desktop mode, we'd advise against it. The small screen size and tiny icons make it almost comically ridiculous trying to get anything done and even accessing the settings require far more patience than we have. While it's nowhere near on par with iOS or Android, the app selection on Windows 8.1 is no-longer something to poke fun at. And as you can run regular PC applications here too, there's plenty of scope for getting things done. There might not be Spotify app in the App Store, for instance, but we downloaded, installed and ran the regular Windows desktop client just fine. You also have full access to Microsoft Office as the T1 comes with a year subscription to Office 365. This also gives a 1TB of OneDrive storage, another nice touch. There are two cameras included here, a 5MP one the back and a 2MP version on the front. There may as well not be one on the back though, it's bad. It's slow to start, slow to focus and slow to capture. When do you take a snap, it's grainy, over exposed and full of noise. It's a better story for the front facing snapper though. Skype video calls looked clear and even selfies didn't look that bad. Though taking a selfie with a tablet is near the top of our 'things never to do' list. We mentioned earlier that you get a standard 32GB internal storage with this device, though only 24.3GB of that is available and after installing just a few apps (Netflix, Twitter, Facebook, Plex etc) that was down to 17.2GB. Thankfully, there's a MicroSD card slot on the side for expanding the storage. The 4,300 mAh battery got us a couple of days of juice, though if we really pushed it and played some games, streamed a few hours of video and used Spotify on the desktop, we could end up hitting the red by the end of the day. If you use it solely for browsing and checking your emails you won't be reaching for the charger every night. Costing just €159, the Eve T1 is a tablet that has a lot going for it, with very few real issues. It's fast, has a good display that isn't ruined by intrusive bezels and is constructed from materials that haven't simply been chosen because they are the cheapest on offer. Yes, the overall build is far from perfect. It's creaky and produces some odd noises, but in real life use you won't be applying that much pressure to make these annoyances really a deal-breaker. Again, the rear camera is awful but you don't need to use it and it doesn't make anything worse off by it being there. The screen size is ideal for a media consumption tablet and having full access to Window 8.1 is a nice touch. 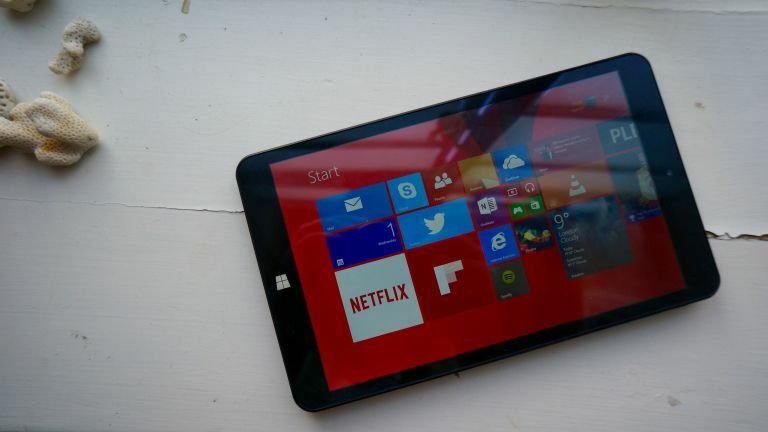 With Windows 10 coming soon, this tablet could, and should, improve further. It's refreshing to see start-ups taking a positive approach to building new products that doesn't involve cutting every corner possible.